I made this beautiful gluten free, sugar free rhubarb, strawberry pie for Christmas Day Dinner. I came back to my computer a couple of days later to type the recipe into this blog, and guess what? I lost the recipe. It was a beautiful, light, flavorful shortbread type crust made from gluten free brown rice flour, tapioca flour, and coconut flour. I can’t remember how much butter and water I used though, so I have to try and recreate the pie crust recipe. I thought when I made the original crust that it would make a nice cookie as well. 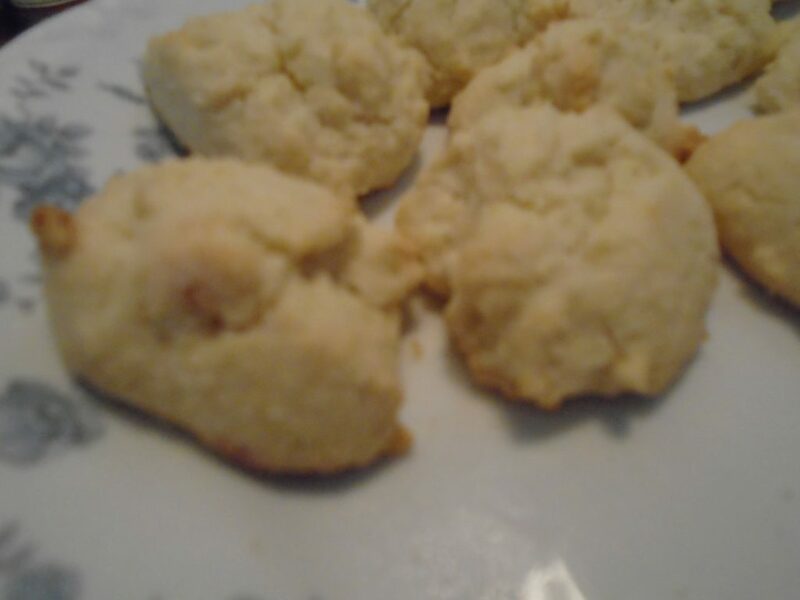 Here is the first try at a gluten free, sugar free cookie. I like the taste and texture, but it is nothing special. It turned out to be a soft cookie, with flavor but nothing too distinguished. Below are the ingredients and measurements I used to make the cookie. They couldn’t have been to awful tasting after all I ate all two dozen of them. Teaspoon fulls onto parchment paper on cookie sheet. Bake 15-20 min, until golden brown on the bottoms. Why don’t you give these a try, they are a nice light, little cookie that can surly satisfy anyone who is stuck on a diet of hard, crunch things for snacks. I get tired of eating nuts and seeds all the time and want something soft to snack on. These cookies fill that bill. I will be trying different things like adding peanut butter, or chocolate to see how I can change it up, but for a basic gluten free, sugar free cookie this one is pretty good and you can dress it up with a little frosting and some sprinkles if you like. If you bake these cookies, please let us know how they turned out for you and what you think of them. If you are tired of eating healthy food that taste like your lawn, or a cardboard box then you have to try these cookies. Remember, Keep on Crafting Montana!